Daguerreotypes of unknown subjects from the Eastman House’s study collection. 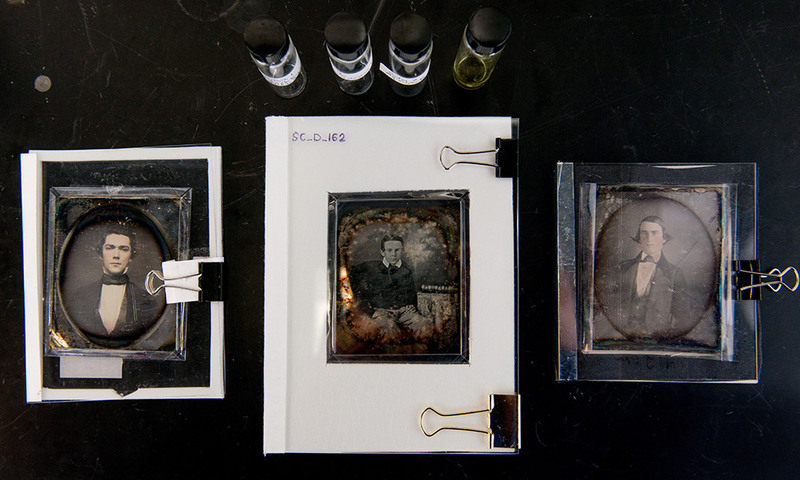 University and Eastman House researchers are working together to find out how to preserve daguerreotypes in the face of mysterious deterioration. In 1839, Louis-Jacques-Mandé Daguerre unveiled one of the world’s first successful photographic mediums: the daguerreotype. The process transformed the human experience by providing a means to capture light and record people, places, and events. The University of Rochester is leading groundbreaking nanotechnology research that explores the extraordinary qualities of this photographic process. A new exhibition in Rush Rhees Library showcases the results of this research, while bridging the gap between the sciences and the humanities. “Researching the Daguerreotype at the University of Rochester: Nanotechnology Meets Local History” features daguerreotypes from the River Campus Libraries’ Department of Rare Books, Special Collections and Preservation; the Rochester Museum and Science Center; and the George Eastman Museum. For over 175 years, surviving daguerreotypes have been carefully preserved in private and public collections and displayed in museums and cultural institutions around the world. While damage to daguerreotype plates is often visible by eye, evidence of further deterioration may only be detected at the nano level, by looking at features that are hundreds or thousands of times smaller than the width of a human hair. From 2010-2014, a National Science Foundation grant supported nanotechnology research conducted by two University of Rochester scientists—Nicholas Bigelow, Lee A. DuBridge Professor of Physics, and Ralph Wiegandt, visiting research scientist and conservator—who explored how environment impacts the survival of these unique, non-reproducible images. In addition to conservation science and cultural research, Bigelow and Wiegandt are also investigating ways in which the chemical and physical processes used to create daguerreotypes can influence modern nanofabrication and nanotechnology. Blending the past with the future, the exhibition displays the first known daguerreotype of a Rochester graduating class (1853) alongside a 2015 daguerreotype of current University President Joel Seligman, created by Rochester daguerreotypist Irving Pobboravsky. The exhibition will also include a rare daguerreotype of famed abolitionist Frederick Douglass on loan from the Chester County Historical Society in Pennsylvania. Once owned by Susan B. Anthony, this unique portrait will be examined under electron scanning microscopy and displayed with new research findings into its creation and preservation. The exhibition is on view through February 29, 2016 in the Friedlander Lobby of Rush Rhees Library. A special presentation about the scientific advances surrounding the daguerreotype and their relationship to cultural preservation will be led by Bigelow, Wiegandt, and Jim Kuhn, assistant dean for Special Collections and Preservation, on December 14 from 7-9 p.m. in the Hawkins-Carlson Room of Rush Rhees Library. For more information visit: http://www.library.rochester.edu/event/daguerreotype-exhibition or call (585) 275-4477.